Happy Fiction Friday! I have some GREAT ones for you today! My picture book for you is called C is for City. It is written by Nikki Grimes and illustrated by Pat Cummings. Just rolls off the tongue! The book is set in New York City, but is applicable to any big city and I'm pretty sure most kids would relate it to a big city they know. I also learned something from this book - that "ghetto-blaster" is another word for boom box. News to me! My chapter book for you this week is legit AMAZING! I read this in less than a day and I could not get enough of it. Here it is, Inside Out & Back Again by Thanhha Lai. Even the cover is beautiful! This is the story of Hà, a Vietnamese girl who escapes to America at the end of the Vietnam War. She ends up settling in Alabama, and the book details her struggles to learn English, to live in a country where she is not part of the dominant culture, and to endure discrimination and bullying based only on her country of origin. This book is written in verse, which really worked well. Thanhha Lai's choice of language was nothing short of beautiful. It was so descriptive, she used a ton of figurative language... it was like I was really there picking papayas with Hà and trying to choke down a hot dog for the first time. This would be a great mentor text for word choice beyond just a great read-aloud in general! Inside Out and Back Again sounds great! 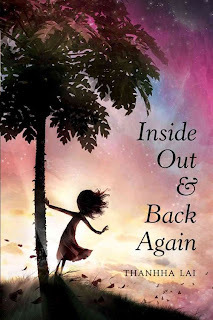 I really want to read Inside Out and Back Again after your review! I need to finish something first! See you Thursday! Both books look fantastic! I actually almost ordered Inside Out & Back Again today, but had to cut myself off somewhere. It will be part of my next order for sure. I'm also in love with the cover C is for City. Is that published by Candlewick Press? It looks like them. I think I am going to have to start collecting alphabet books; there are so many cool ones! Thanks for linking up again this week. Happy Reading! Wow! Both of those books sound amazing. I will definitely have to check them out soon. Thanks so much for the recommendations!!! Thank you for sharing! I am always glad to find new books. I'm so curious about Inside and Out! I'll be on the lookout for it to add to my library! I am nominating you for the One Lovely Blog award!